As your rug begins to age, you might start to notice some wear and tear. Rugs in high trafficked areas of your home will show damage faster than others. We are often asked about rug repairs and one common concern is the appearance of little white knots in rugs. So let’s discuss what white knots are in rugs and if you need rug repair. Many rug owners, and even rug cleaners, aren’t aware that even rugs with a label of 100% Wool, actually contain a large portion of cotton. If your rug has a cotton fringe, then it is very likely that those tassels are actually part of the warps that run from one end of your rug to the other. When rugs are created they are woven onto a series of fibres known as warps and wefts. Warps are the fibres running the length of the rug, and wefts are fibres running the width of your rug between the row of knots to hold them in place. The wool of the rug is then twisted and knotted around the warps and packed into place by the wefts. But those who weave rugs do not have an infinite spool of cotton to use. When one strand is finished, it is tied to another strand so they can continue to wrap the warps around the loom. This is also done with the weft strands. Wefts are run in front and behind the warp strands to hold the wool of the rug firmly in place. Due weavers constantly packing knots into place, warps and wefts can break during the weaving process itself. Weavers will then tie the two broken ends back together to make on-the-spot rug repairs. 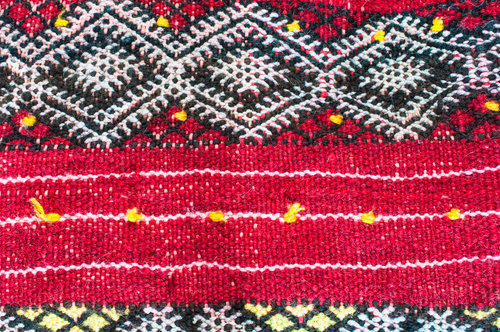 This means that every hand woven rug contains a lot of foundation fibre – or cotton – knots. The white knots you find in rugs are the tie off points for whatever foundation fibre your rug uses. White knots in rugs are a characteristic of hand woven rugs and are not rug damage. Why do White Knots Become Visible in Rugs? When white knots show during the weaving stage, rug makers either push the knot to the backside of the rug with a needle, clip down the loose strands to make the knots shorter than the rest of the rug pile or blend them away with dye. But what about your rug? There are two ways white knots can appear once they are in your home, age and washing. As a rug ages, the wool pile wears down due to foot traffic and use. White knots that were once hidden by the wool pile are then revealed. This is one of the most common reasons for white knots to show, especially in new rugs. Further, modern rugs show a preference for short piles, which makes knots show earlier than in older rugs. Another cause for white knots to show is a thorough wash. This does not mean that a professional rug wash or rug laundry has damaged your rug in anyway. As a rug is used, it gathers kilograms of dirt. This dirt not only darkens the colours of your rug, but also the white knots of the base fibre. When your rug is properly washed, the entire rug foundation is cleaned too. This means that the cotton fibres are now freshly white again. Because a rug wash focuses on cleaning the entire rug, not just the surface, this means knots that would have been hidden due to layers of dirt are now visible in the pile. Further, if you can already see large white knots on the back of your rug, you will be able to find the matching one on the front quite easily. How Can I Prevent White Knots? It is impossible to completely prevent white knots appearing in your rug, however there are ways to prolong the life and look of your rug. One of the best ways to slow down the aging process of the rug, and avoid costly rug repairs early into ownership of the rug is ensuring there is a good pad under all handwoven rugs to lessen the friction created by foot traffic. Do White Knots Need Rug Repair? There are some options for dealing with white knots showing in rugs, new or old. The first is to leave them alone and not attempt any rug repair techniques. This is often the best option, especially in the case of older rugs and where knots are not overly visible. The second option is to have a technician, skilled in rug repair, to gently push the knots back toward the underside of the rug. However, this needs to be done extremely carefully as breaking or unravelling these knots can create holes in rugs. 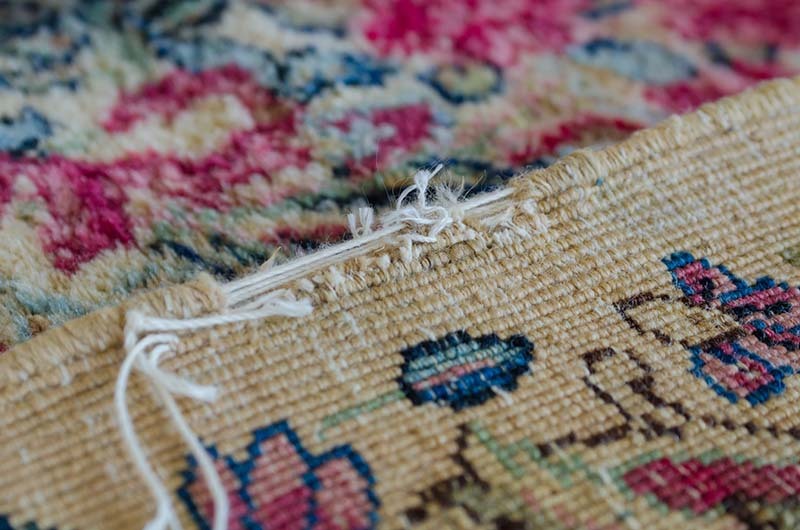 If there are more white strands, from the ends of the knots, than knots themselves, you can have a skilled rug repair technician clip them down again to match the pile. However, trimming knots needs to be done carefully and gently to avoid creating holes. Finally, a skilled rug repair artist can gently dye the knots to match the surround rug. Think of it as makeup for your rug! This does not mean the knots are gone, they are simply blended in. While this is a safer option than manipulating the knots themselves a rug repair technician must be careful when choosing dyes to ensure there is no bleeding of colour or damage to the rug due to the dye. If you have a rug that is showing white knots or is in need of a thorough wash, contact Woods Rug Laundry today. With decades of experience, our rug wash technicians and skilled rug repairers are happy to help you will all your concerns!